The Virginia creeper that covers my garage wall looked like this on Thursday. Today, after the rain, the stems are bare of leaves. The complex weather system that’s bringing us our first taste of fall is still blowing through–the sun is shining brightly now, but more rain is forecast for tonight. The rain so far isn’t as much as I had hoped; my rain gauge shows about 1 1/4″. According to today’s NY Times, rainfall in New York City is still 20 percent below normal for the year. Keep watering! On the positive side, if you were planning on doing some fall planting, this is the time. The soil is moist and the temperatures are supposed to remain cool this week. The weather is perfect for weeding–pleasant temperatures and moist soil. Once things dry out and the wind dies down, be sure collect some leaves. And we may have a freeze Wednesday night, so harvest your remaining tomatoes and other tender crops. The next few days will be great days in the garden. Look carefully at the top of the pole and you’ll see an enormous raptor that spend most of Friday afternoon drying its wings in front of my house. This spring, I did a lot of renovation in my perennial beds. Two very tall and enthusiastic plants, Rudbeckia subtomentosa and Monarda fistulosa, had spread into the fronts of the beds, shading out smaller plants. I dug out and gave away what amounted to hundreds of plants and replanted the fronts of the beds with a variety of lower-growing grasses and perennials. In this post, I’ll show you some of the new plants; most are now in bloom. The photo above shows a spot that was completely replanted this spring, except for the existing little bluestem grasses that frame it on either side. 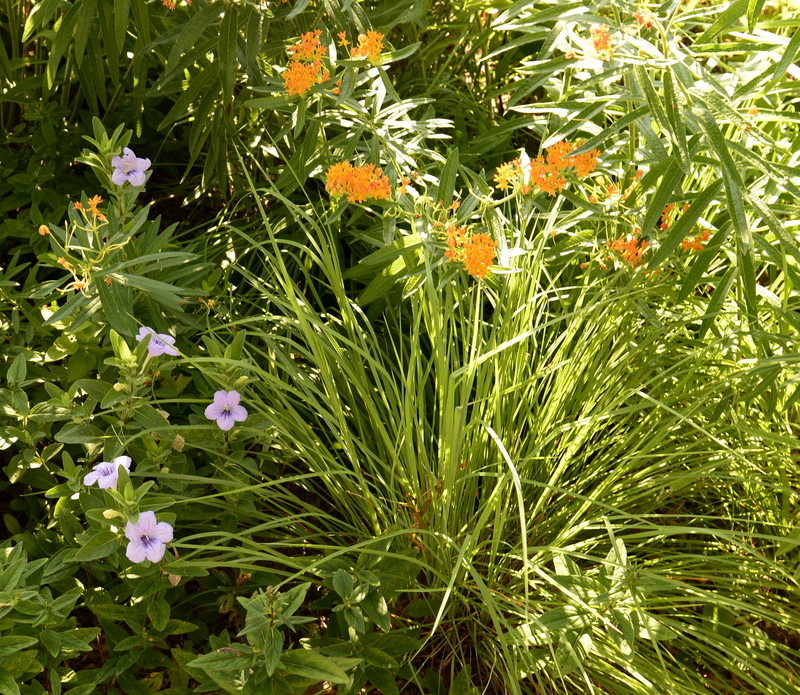 There are sundrops (Oenothera fruticosa [yellow, left]), orange butterflyweed (Asclepias tuberosa), bergamot (Monarda fistulosa), Culver’s root (Veronicastrum virginicum [white, left]), dotted mint (Monarda punctata [white, right]), and lanceleaf coreopsis (Coreopsis lanceolata [yellow, right]), and other things that haven’t bloomed yet. Look carefully on the right and you’ll see nodding pink onion (Allium cernuum) full of buds. I’m very pleased with this arrangement of new and established plants. Here’s a better view of the dotted mint in a different perennial bed. Behind it you’ll see another new addition, a hoary vervain (Verbena stricta) that’s now showing buds. 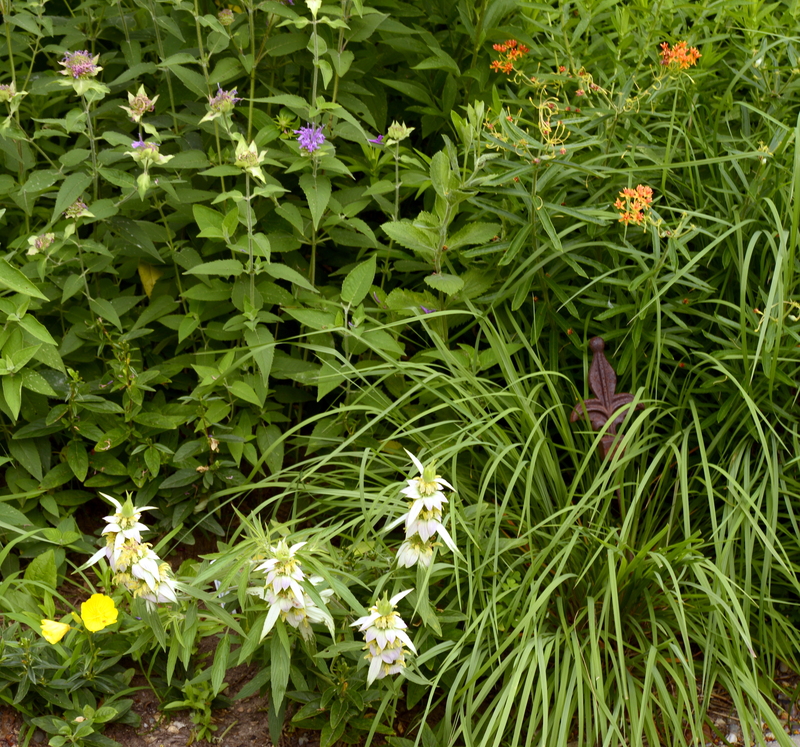 It will replace the blue/purple of the monarda, which is almost finished blooming. And in yet another bed, here’s lovely light purple wild petunia (Ruellia humilis), another low-growing lover of dry soil. This is a plant that you have to hide from the rabbits. Some years they find almost all of it; other years, like this one, it blooms for months. Why is this year different from other years? 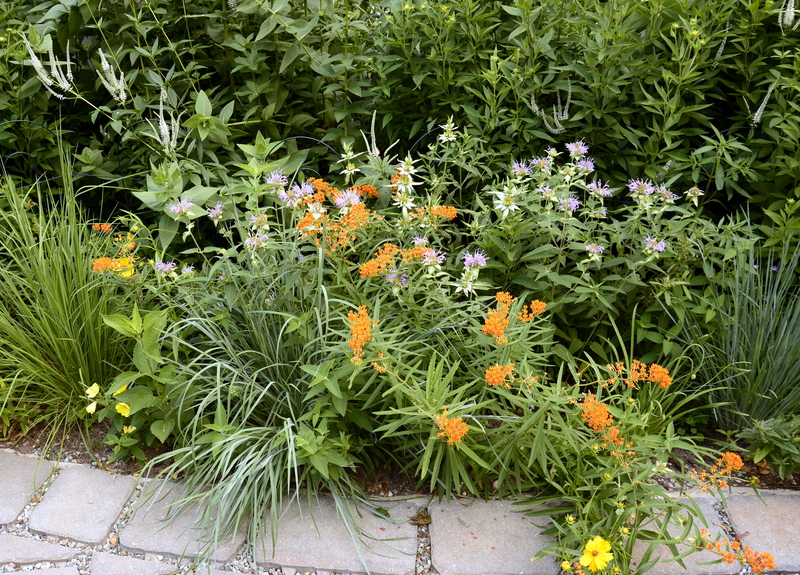 Look for an upcoming post about short-term changes in the native plant garden.